3 in. 24 Grit. Premium Blue Zirconia grain. Excellent for use on door jambs or drip rails where regular resin fiber discs are too big. For even tighter spaces, the disc can be trimmed down to even smaller diameters. Sungold trim cut discs can be trimmed down to a smaller diameter to create a clean outer edge. No back-up pad needed. Built in! 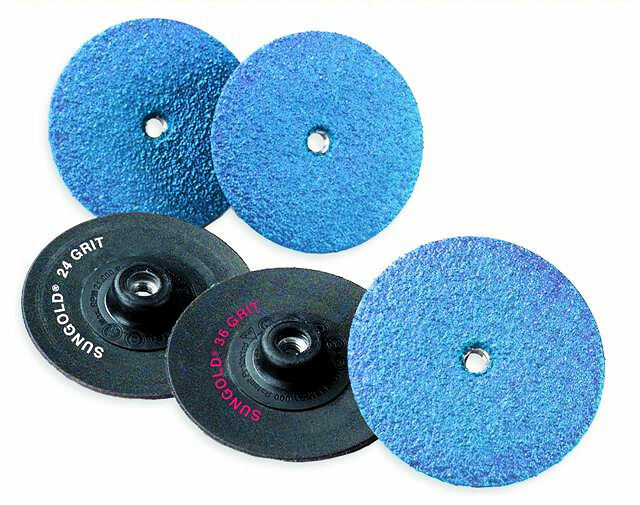 Can be used for all your grinding needs or use just in places that you cannot reach with the larger fiber discs. The discs are quickly attached and detached from the mandrel without removing the mandrel from the tool. Included in each box is a 1/4 in. mandrel that fits most popular die grinders and drills.